My son started kindergarten this year so now we are limiting his video games during the week, which of course he hates. So trying to find something that he finds fun and I find educational is exactly what I found in the Vtech Innotab 3. I was thrilled to get the opportunity to review this awesome product. The Learning Lodge™ features more than 350 educational games, e-books, music and videos developed specifically for each child’s unique stage of development and will nearly double its current selection by the end of the year. Starting with activities suitable for toddlers and expanding to grade schoolers, the Learning Lodge™ gives every child an opportunity to expand their learning potential while keeping them entertained. Featured throughout the downloads and software cartridges are popular characters from Monsters University®, Turbo®, Planes®, Doc McStuffins®, Sofia the First®, Jake & the Never Land Pirates, Mike the Knight™, Angelina Ballerina®, Team Umizoomi™, Dora the Explorer™, Thomas & Friends®, Teenage Mutant Ninja Turtles®, Sesame Street and many more. We received the Vtech at a perfect time, it was Cooper’s 6th birthday. So of course my family are last minute shoppers and asked what they could get him. I immediately told them Vtech Innotab3 Cartridges. I knew Cooper would love this new gadget. Oh course he did! Because Daddy has a big boy tablet, Cooper thinks he now is ubber important because he now has his own tablet. He is so in love with the WonderCam and keeps taking pictures of himself. It’s so cute. For his birthday he got the Scooby-Doo cartridge. He can learn math, science, logic and so much more. Each cartridge is filled with different ways to get your keeps to now only learn to but retain the information. I just love how much fun he has playing with it. It’s such a great alternative to playing mindless video games that have no purpose. I must prefer the educational electronics that Vtech provides. 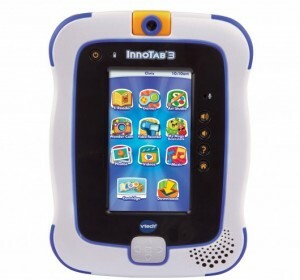 One lucky reader will win their very own Vtech Innotab 3. How awesome is that? Hurry because this ends on 9/26! US residents only. Good Luck! I knew about this giveaway because I subscribe to your emails! I really like the Kidizoom camera! My niece is almost 4 and wants to take pictures like her Mom does. This would make a great Christmas gift! I follow you by e-mail. My grand daughter would love to play with the 2-1 shop and cook play set. I am an email subscriber so found the giveaway in my inbox. I would love to win this for my son. I found it from a link on another blog. I also like the Count & Colors Bouncing Frog. It is so adorable! I saw a tweet about it in my timeline. I found out about this giveaway via Twitter. Thanks. I like the KidiBeats Drum Set – Pink. I Also Love The VTECH Move & Zoom Racer! I found out about this giveaway through e-mail. I visited V-Tech and love the Move & Zoom Racer! Oh I also love the Spin & Learn Adventure Globe! I found it on a google search. I found out about the giveaway on twitter! I like the Lightning Mcqueen Atlas. I found this giveaway while looking for reviews of it on Google! I really like the switch and go dinos. I found out about your giveaway on twitter! I love Jagger the TRex Switch N’ Go dino’s too! I found this because I entered another one of your giveaways. I found this giveaway on twitter, and I like the kidibeats drum set! I like the Kidizoom Camera! I found out about this giveaway because I am an email subscriber. I like the Alphabet Apple. I found the giveaway through twitter! I love the Kidzoom Camera too! we also like the switch and go dinos. I like the Count & Colors Bouncing Frog, it would be perfect for my daughter to get out some extra energy while learning. The move and zoom racer would be my little guy’s favorite for sure! We also like the 2 in 1 Shop & Cook Playset . I found out about the giveaway through your email. I love the Switch n go Dino’s!! Not, since we found out.